It was in 1986 that wine consumption broke its first record with a 2.43 gallon per capita, before plunging back into a 10 year long decline. 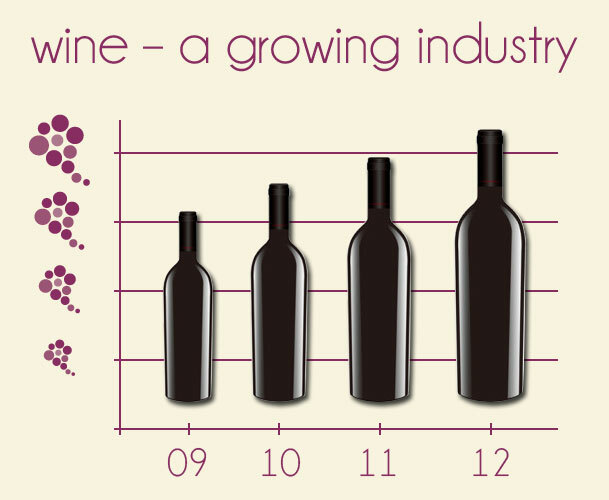 Since then, U.S. wine consumption has made a comeback and continued to grow at a steady pace, to reach new highs in 2012. While beer consumption has been on a losing streak, wine is getting its groove back. Led by a wave of artisanal and boutique wineries, wine is winning a new generation of fans and surging in popularity. I really enjoy a nice cold brew once in a while. I like to drink it in a glass, a mug, or even a chalice if it applies. I always match the right beer with the right glass… just like wine ; ) The choices are limitless and I can always find the right beer to quench my thirst. That said, increased competition from other alcoholic beverages, like fine wines, vodka, cocktails and whiskey, have nipped at beer’s popularity. High unemployment rates among core beer drinkers and a weak U.S. economy overall have also contributed to the decline in beer drinking over the past decade. As consumers expand their tastes for such alternatives and disposable incomes improve, demand for traditional beer will drop. Nonetheless, craft brewers have successfully competed with alternative beverages on the market with high-end beer products. While light beers are among the hardest hit, craft and imported beers appear to be bucking that trend. Americans increasingly opt for craft beers, rather than mainstream beers over the last decade. California has become the nation’s chief source of entertainment — and not just because of Hollywood. Napa Valley, Sonoma County and other regions have helped place wine on more and more dinner tables. It doesn’t hurt that wine from the U.S. has a reputation for being a better value than imports (c.f. : The Paris Wine Tasting or the Judgment of Paris organized on 24 May 1976 by Steven Spurrier – “Bottle Shock”). As wine lovers discover new regions and varieties of wine, including sweet reds and higher-end blends, wine consumption is expected to continue to increase over the next five years. Wine has become more accessible by all and lost a great deal of its snobbishness. Thanks to some very successful wineries and some clever marketing, winemakers from around the world are making an effort to reach out to younger wine drinkers. Using social networks and online content (audio & video), winemakers are able to publicize their wines to more people than they could have ever guessed. This is a new world out there, and in spite of its VERY old age, wine has been able to adapt quite well, securing itself a safe and stable future for all of us to enjoy.